Browse the article Has a video game cured HIV? Here's a quick, visual breakdown showing how the proteins fit in with our genetic makeup. Proteins are responsible for numerous functions in the body, everything from converting food into energy to delivering chemical messages. Each protein's peculiar origami determines both its role and its ability to hook up with other molecules. It's as if a protein were a chain made up of a thousand locks, all bunched in a ball: If you wanted to design a drug to affect it, you would need to know which locks were turned outward, and in what pattern, so that you could cut a set of keys to fit them. Particular proteins play pivotal parts in key chains of events. Researchers prize these proteins because they represent a vulnerability that they can exploit to slow or stop a disease, including retroviruses like HIV and MPMV. A retrovirus is a virus that carries its genetic information as ribonucleic acid (RNA) instead of DNA. These viruses transcribe their RNA into DNA, instead of vice versa, permanently enmeshing their genetic code into the infected cell's genome and transforming it into a factory for making more retrovirus. Retroviruses rely on a protein catalyst called protease enzyme as part of their reproductive process. Inhibiting that protein throws a monkey wrench into a retrovirus' machinery of destruction. Indeed, such protease inhibitors are already used to treat HIV infection in AIDS patients [source: Britannica]. Unfortunately, teasing out the structure of such proteins is one of the most difficult puzzles we know of. Imagine filling a giant box with tangled Christmas tree lights, disused Slinky toys, barbed wire, duct tape and electromagnets, then shaking it and flipping it around, and finally trying to guess what shape you'd made. You've only begun to scratch the surface of the complexity of this task. Proteins can consist of more than 10,000 atoms apiece, forming chains, sub-chains and bonds in countless combinations; in fact, there are more ways to fold a protein than there are atoms in the universe [source: Bohannon]. Such complexity is more than even a supercomputer can sometimes handle, particularly because computers are not especially good at working with three-dimensional shapes. So, scientists started looking for a faster and more effective means to crack protein structures. Their solution? Use the innate spatial analysis abilities of the human brain. Foldit was born. Almost immediately, it began paying dividends. In this next section, we'll take a closer look at how Foldit works, what gamers have accomplished with it and whether or not they cured HIV. An essential part of the watchmaker's craft consists of assembling a collection of delicate parts within as compact a space as possible, while ensuring that the tight quarters don't interfere with the timepiece's function. 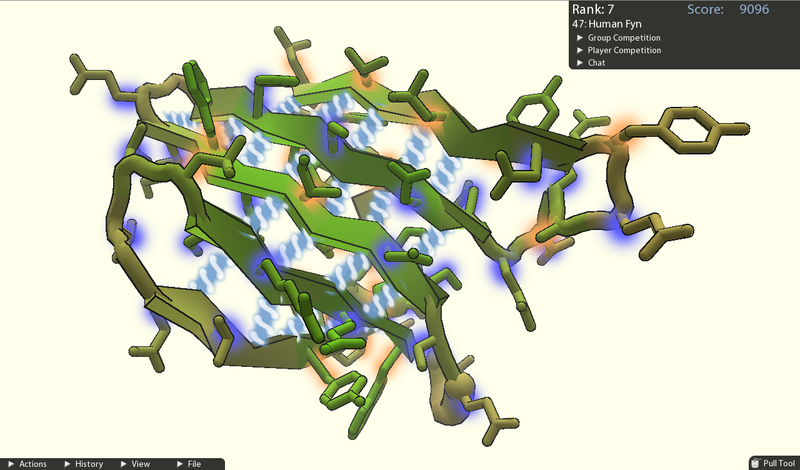 In Foldit, players use a simple box of tools to manipulate the shape of a protein. The idea is to bend, twist, move and shake the protein's side chains and amino acid backbones such that the whole structure is packed into its optimum shape. Players know their solution works when they get rid of collisions between side chains of atoms, hide the hydrophobic chains inside the protein, face the hydrophilic chains outward and remove large empty spaces that threaten the stability of the protein -- all of which is reflected in their score. The score, along with rules governing permissible moves, derives from the laws of physics governing protein folding. Thermodynamics tells us that natural systems tend toward states of lower energy. Other physical laws, such as the mutual attraction of opposite charges, repulsion of like charges and limitations regarding how atomic bonds can be arranged and rotated, are also built in. The Foldit program abstracts the details into a form that the eye can perceive and the brain can grasp. Physics are handled behind the scenes, freeing players to manipulate the shapes via meticulous analysis, gut instinct or whatever method suits them. Within a year of its introduction, Foldit players produced protein-folding solutions that outshone those submitted by molecular biologists. Inspired by early successes, Foldit's creators applied the program to other proteins and tasked players with designing new proteins to fight cancer, AIDS and Alzheimer's disease. For example, the p53 tumor suppressor protein is damaged in many cancer patients. If repaired or replaced, such a protein might stop tumor growth. Successfully puzzling out the protease enzyme MPMV is the capstone of Foldit's career so far. Before they got there though, players churned through tens of thousands of ever-improving prototypes until, less than three weeks after they began, they had solved this particular protein puzzle [source: Niemeyer]. It wasn't a cure for HIV but, thanks to a retroviral family resemblance, MPMV's protein catalyst will help researchers build better antiretroviral drugs with which to fight HIV. Foldit is not without its limitations, nor is it a Rosetta Stone for all proteins. Nevertheless, it enabled a crowd of players to predict the structure of a protein that had defied all traditional approaches, and that alone justifies its value as a tool for molecular analysis. Increasingly, scientists are taking advantage of mass collaborations to cheaply generate ideas and bring a wide variety of perspectives to bear on research questions. Foldit is a computer-aided form of such crowdsourcing, but crowds can also aid computers. For example, in distributed computing, people volunteer their computer's idle time to be used in solving a problem. Individually, these processing cycles don't count for much, but combined, they add up to a virtual supercomputer. Made famous by the search for extraterrestrial intelligence's SETI@home program, distributed computing helps model protein structures as well. Rosetta@home, also developed at University of Washington, has been installed on hundreds of thousands of host machines, providing a valuable alternative to more traditional protein analysis techniques, such as X-ray crystallography and nuclear magnetic resonance spectroscopy (NMR).